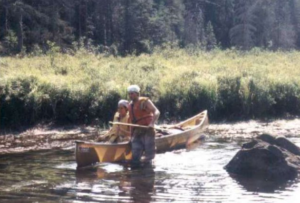 In September 2002 we crossed, together with our good friends Bruno Amato and Roy Perritt, the Algonquin Provincial Park on a 12 days canoeing expedition. Established in 1893, it is the oldest provincial park in Canada.] Additions since its creation have increased the park to its current size of about 7653 square kilometers. For comparison purposes, this is about a quarter the size of Belgium. The park is contiguous with several smaller, administratively separate provincial parks that protect important rivers in the area, resulting in a larger protected area. 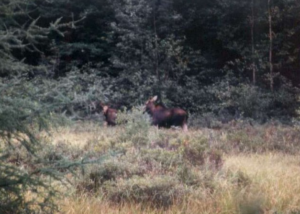 Its size, combined with its proximity to the major urban centers of Toronto and Ottawa, makes Algonquin one of the most popular provincial parks in the province and the entire country. Highway 60 runs through the south of the park, while the Trans-Canada Highway bypasses it to the north. 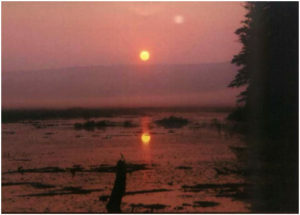 Nipissing, Amable du Fond, Madawaska, and Tim rivers. These were formed by the retreat of the glaciers during the last ice age. The park is considered part of the “border” between Northern Ontario and Southern Ontario. The park is in an area of transition between northern coniferous forest and southern deciduous forest. This unique mixture of forest types, and the wide variety of environments in the park, allows the park to support an uncommon diversity of plant and animal species. It is also an important site for wildlife.